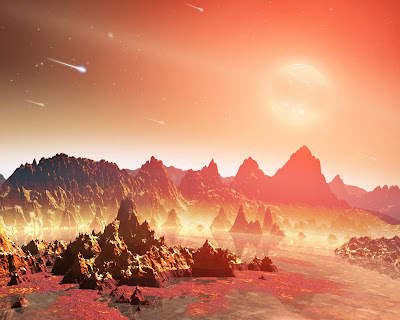 A hypothetical young planet with a soupy mix of potentially life-forming chemicals pooling around the base of rocks. Drawing by NASA. From fall to spring, Lakshmi Anumukonda is a science teacher at a metro-Atlanta high school. But in the summer, she dons a lab coat and becomes a molecular time traveler. Anumukonda is exploring the origins of life some 3.5 billion years ago through the Center for Chemical Evolution. Several dozen middle- and high-school teachers are involved in the virtual center (formerly known as the Origins Project). 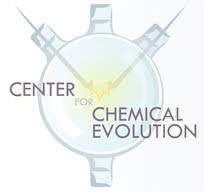 The roots of the Center for Chemical Evolution go back nearly a decade, growing out of collaborations between Emory and Georgia Tech. The latest phase of the venture launched this week, fueled by a $20 million grant from the National Science Foundation and NASA. The center now encompasses 15 laboratories at institutions including Emory, Georgia Tech, the Scripps Research Institute, the Scripps Institution of Oceanography, Jackson State University, Spelman College, Furman University and the SETI Institute. The center’s mission “gives me goose bumps,” said Matthew Platz, incoming director of the NSF Division of Chemistry. Platz recalled his own sense of wonder in high school, when he learned about the 1953 Miller-Urey experiment. That was the first demonstration that Earth’s primordial soup favored chemical reactions that could lead to organic compounds. As the university scientists seek to unravel how life began, the high school teachers are seeking ways to connect their students to the discoveries. 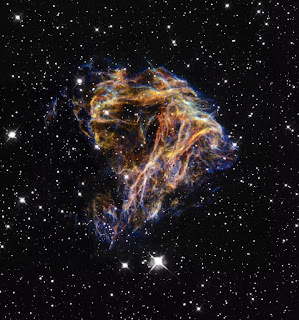 A supernova explodes, below, scattering elements of which we and the Earth are made into space. Credit: Hubble Heritage Team, Y. Chu, NASA. This summer, she worked alongside scientists in the lab of David Lynn, chair of chemistry at Emory. Lynn leads research into molecular self-assembly and other forces of evolution, along with the center’s education and outreach component. Anumukonda used her lab experience to develop lesson plans for the self-assembly of molecules. This fall, her high school students will prepare samples of sodium acetate, and then take a field trip to Emory, where they can see through an electron microscope how their samples crystallize under different conditions. “It’s wonderful to learn about the potential for real-world applications,” said Robert Hairston, another high school science teacher who spent much of his summer in Lynn’s lab. He was intrigued by how the forces of evolution could be harnessed to help in drug design and genome engineering. Emory seeded the educational component of the center through an “Evolution Revolution” symposium, teacher workshops, theatrical performances, visual arts and public talks to bring people together to discuss the topic. Should high school chemistry be fun?